Erika Cuellar: Bolivian pride! one of National Geographic’s explorers!! 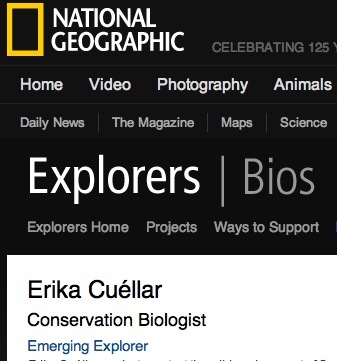 I have mentioned Erika Cuellar back in June 2012, for that post, please click here. 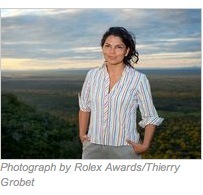 We have to be proud of her, she is National Geographic’s recognized and renowned explorer! Follows NatGeo’s page about her and below the links of Bolivian newspapers regarding her accomplishments! South America’s Gran Chaco region spans an exceptionally complex mix of habitats, climates, topography, and species. Equally complex: preserving it from the onslaught of uncontrolled development that could transform the landscape forever. Erika Cuéllar’s innovative solutions and sheer passion bring new hope to the wildlife and people of this imperiled wilderness jewel. Cuéllar empowers those who live in the Gran Chaco to be hands-on stewards of conservation by training them as parabiologists. Communities nominate participants for the 800-hour course covering everything from basic biology, mathematics, and other sciences to producing maps, using computers and GPS, designing research projects, collecting data, and presenting results. Those who pass the final exam bring their professional skills into the forests, wetlands, and grasslands. They make census reports of birds and mammals, deploy and analyze data from camera traps and radio-tracking devices, create maps calculating species’ densities, and monitor changes in wildlife numbers. Parabiologists also play a crucial role in sharing conservation information with their communities to guide decisions about managing land and wildlife. The Gran Chaco covers territory in Bolivia, Argentina, Paraguay, and a sliver of Brazil. Great swaths of that land and populations of species have been destroyed by unregulated cattle ranching, logging, farming, railway construction, sport hunting, and other threats often spearheaded by wealthy city dwellers. Indigenous people in Cuéllar’s native Bolivia felt such strong connection to the wilderness that they convinced the government to create a 3.4-million-hectare protected area in 1997. “Thanks to them, a large portion of the Gran Chaco is still healthy, but in Paraguay and Argentina, it is far more fragmented,” she reports. Her efforts helped outlaw hunting of guanaco, and today she explores repopulating genetically inbred and isolated herds through breeding with herds in Paraguay. She also experiments with ways to recover the guanaco’s grassland habitat, overrun by free-range cattle and invasive plants. She’s asking the local government municipality to create a protected reserve for guanaco, while at the same time creating new, environmentally sustainable ways for local people to earn income. Now she faces her biggest challenge yet: saving the entire Gran Chaco region by extending grassroots efforts up through all levels of Bolivia’s government and beyond to create a multinational endeavor between Bolivia, Paraguay, and Argentina. “I’m working to bring authorities and organizations across all three countries together to establish priorities, obtain a baseline on the current situation, agree on a common methodology, and expand our training program,” Cuéllar says. “Governments need to provide a formal structure and officially recognize our education initiative if preservation projects are to succeed long-term. Back in June 2012, Erika Cuellar was part of The Hall of Bolivian Fame, she continues to make us proud and we thank her for protecting the guanaco, and for training the communities in the Chaco region!